It was such a nice surprise! I’ve been holding onto the card because I’ve been trying to think of a special random act of kindness to do, but inspiration hasn’t hit me yet. 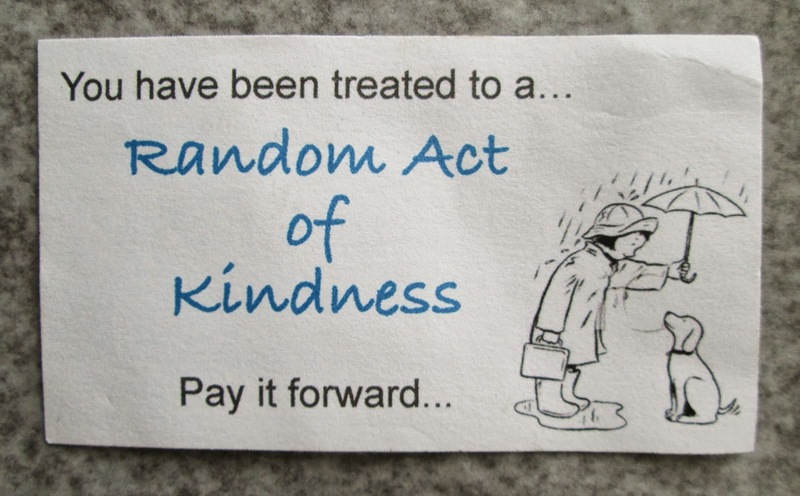 Have you had anyone treat you to a random act of kindness, or have you done a RAK for someone? I’d love to hear your ideas! Hmmm, what else is new? Last week I received some Christmas fragrance samples. I narrowed it down to 3 fragrances that I loved; 1 pepperminty, 1 berry/woodsy, and 1 that just smells like Christmas in a bottle! I can't wait to try them out in soap! Your soap is beautiful! One time years ago when you could pump gas and then pay....we were told the guy next to us who had been talking our ear off (overflowing his gas as he did) paid for our gas....we were pretty poor back then and I thought that was the sweetest thing ever. I know you will come up with something fabulous to pay it forward. Это замечательная идея! Я с таким проявлением доброты у нас уже давно не встречалась! Прежде всего надо начать с себя! Looking forward to seing your soap cut! What did we ever do before Google?! You know what, that's exactly what I was thinking too...it's looks very wintery! I actually wasn't going for that color palette at all, but with winter coming up, it will do just fine! I love hearing stories like that! It's so sweet and inspiring. Years back, I attended a meditation seminar by The Art of Living. One of the things we had to do after we went home was to make a random act of kindness. I was not really sure what I would do, but when I was at the gasoline station, the opportunity presented itself. An old woman was selling flowers so I bought all that she had and gave her some more. The look on her face was precious. I couldn't have been happier that day. Aw, that's so sweet...I bet she still tells that story to this day! How fun that must have been! What a sweet story! It feels so good to do something nice for somebody. Mine don't involve money, but when I'm at the checkout line at the grocery store and someone behind me only has a few items I let them go in front of me. It puts a smile on their face and my face! I just made BRV soap too! I did another black, white and pink tiger stripe, but it appears that my BRV has vanilla in it and my white is slowly turning. Oh well, still smells nice. Your swirls are very pretty! That's such a nice thing to do too, I try to remember to do that as well...it never hurts to take a few extra minutes out of your day to help someone else out! Oooooh, your black, pink and white tiger stripe soap would be so gorgeous, even if the color turns! My last BRV turned neon yellow, so I'm glad this new one is cooperating. PS - how is Milla doing? I was thinking about her lately. So far the white is a cream color and how can you not love BRV no matter what? LOL! Milla has been having a great few weeks despite a few seizures. It's always good when she feels good. She got her hair cut the other week and it seemed to pep her up. She's a tough little dog! Thanks for asking! On a side note I bought some coconut to make coconut milk using my Blendtec blender. Just need to actually do it now. I really want to use it in my salt bars. Just need some extra oomph in there. I think you're always performing RAK Cee, you are so sweet to everyone in the blogging community, and you share all your wonderful recipes and methods. To me that's all RAK. It's been years since I've done an RAK of note - I paid for someone's parking because she didn't have the correct change to plug the meter. Love your black raspberry vanilla soap. I agree with Signe, it's got almost a wintry, snowy look to it and of course the scent is fabulous. Can't wait to see what you come up with for your winter scents. That's so sweet of you to say...I'm happy to share! I've learned so much from other's sharing, that I feel it's my responsibility to pay it forward. That was such a nice RAK, something that probably would have caught the person off guard! I'm excited to start my winter soaps too...it's hard to believe I have to have them made within the next few weeks! What a sweet woman! I just try to help my nearest and dearest especially when they don´t ask for help even if they need it. The swirls are so pretty, especially the blue one. Aww, what a sweet story! I like hearing about random acts of kindness, and I try to perform a few of my own, too. 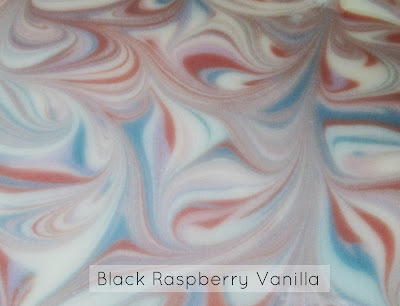 Your Black Raspberry Vanilla swirls look great - can't wait to see the finished bars! I like to hear others' RAK stories too Jenny, some of them are things I never would have thought of! Thanks for your nice compliment on my soap too! Have totally been treated to a free coffee at Starbucks. It's a very nice treat. Doesn't it make you feel more like part of the community? I cannot wait to get my fall/holiday scents in the mail - they are winging themselves to me as we speak. I as well got a woodsy one, something berry and cinnamoney and something crisp and snowlike. I'm looking forward to it. You could always just give someone a random bar of soap! People love little surprises! Beautiful soap Cee! I've had this fragrance for awhile and you have inspired me to use it. We have a fund in our church for people in our church who struggle every month to pay their bills, it's called the Matthew Fund. We have many elderly ladies who barely get by so my most favorite way to pass on the blessings God has given me is to give into this fund. It's a wonderful fragrance Gloria, I think you'll really love it in soap. Lol, it's amazing how much one can hoard, er, accumulate doing different types of crafting! It's wonderful to be able to share it with fellow crafters who would appreciate them...what a great idea Sue! How sweet! I'm sure she made your day, but not only yours,but hers, as well. Oh, fall has fallen onto your blog! Your soap is so beautiful! 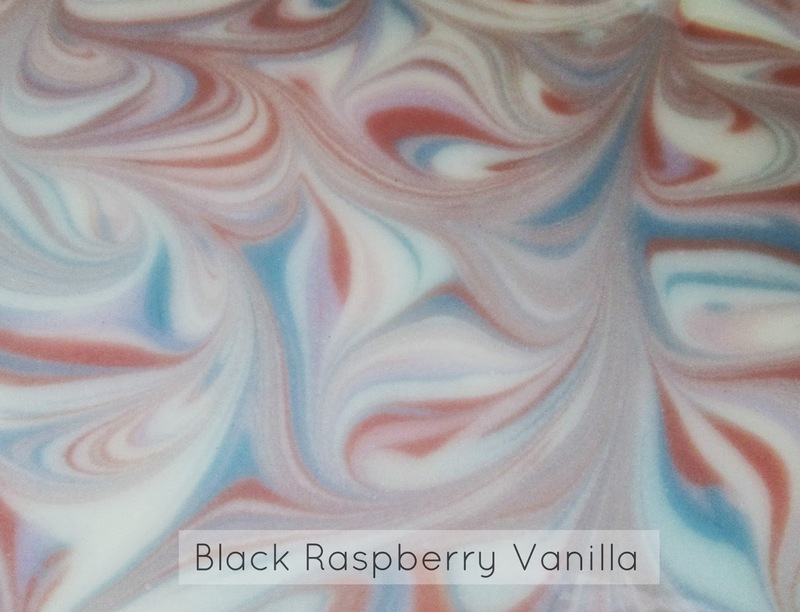 The black raspberry vanilla is such a popular scent and so easy to use in CP! Once when I was an irreverent teen, I ended up on a plane to the wrong city with little money. A kind man gave me money to get me where I was going. A random act of kindness, I certainly didn't deserve! I think of that a lot and try to do nice things for people without expectation. This RAK you experienced was so special. I really enjoyed reading your story. I bet that your new soap looks so good! Hooray for RAoK! I TRY to get at least one a day, even if its something little like holding the door for someone, or letting someone know their shoe is untied. That little card is such a great idea! Thanks so much everyone! Heather, nice to see you around again! That's such a bummer about the non-bleeding red :( You reminded me that I still haven't shown the cut pictures of the soap yet....next blog post!